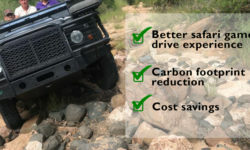 In our frenetic lives, it’s the norm to grab that cup of coffee, a bowl of Cornflakes and the car keys – all on the run. Ironically, in Africa, breakfast on the run is not a rushed affair. Timing is everything, and patience is a virtue especially for the lions in the Okavango Delta. 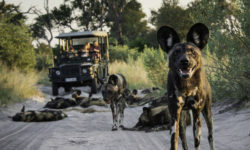 Liquid Giraffe guests recently stayed at Chitabe Camp in the Okavango Delta and relayed the thrilling tale of watching a lion kill a warthog for breakfast. “It’s not long after sunrise on a Thursday morning. 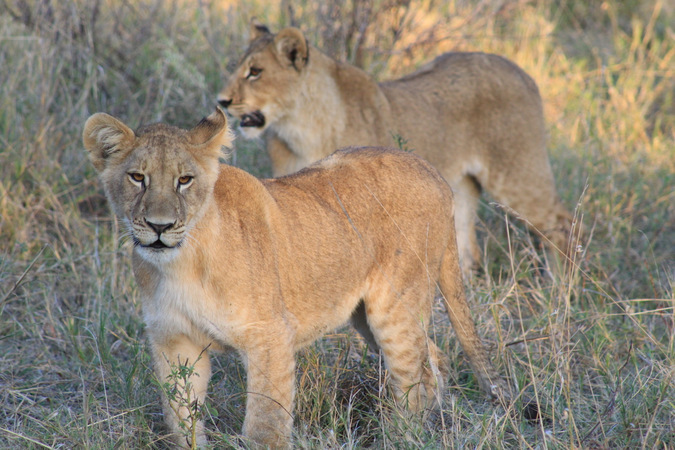 We (two guests, myself and our guide) saw a lioness walking down the track with her two playful teenagers. 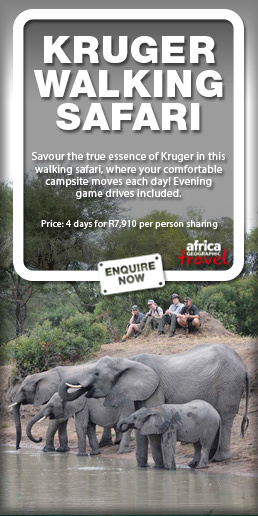 We excitedly watched as they walked past our safari vehicle. 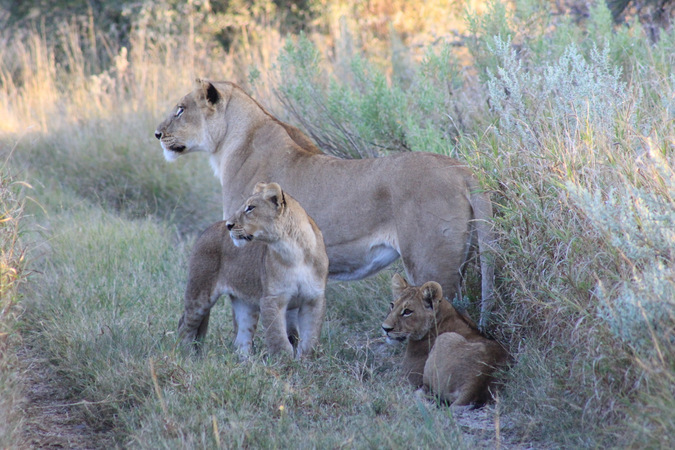 It was clear that mama lion was on the lookout for breakfast. Half an hour later, after following her and her youngsters, we saw a herd of red lechwe in the distance. She eyed them and stopped. The teenagers, knowing that their mother was on the hunt, also stopped their antics and sat and waited, silently. Twenty minutes later, she finally pounced and a blur of animal shapes whirled past our vehicle. We turned to follow her a few yards down the track and saw that she had caught a large warthog. The chase took just seconds really. She had the warthog on its back just a few inches from us, and we were in awe. The warthog squealed – a high pitched frenzied noise of terror. 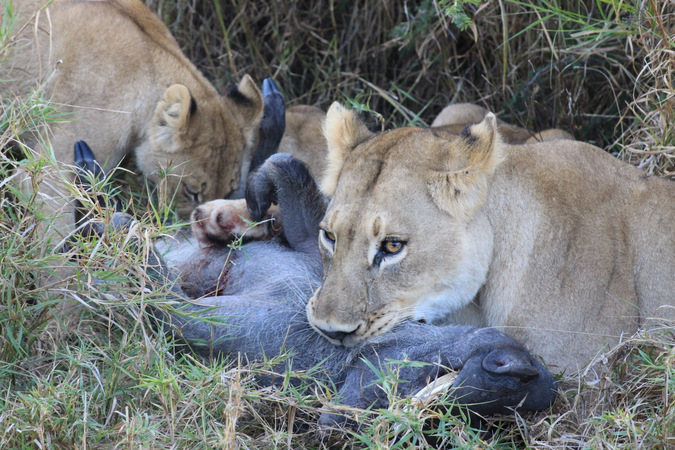 The lioness simply held her grip of death on the hog’s throat, unperturbed by our presence and totally dedicated to the task of getting breakfast ready for her family. During the twenty minutes we watched this scene, her eyes did not waver from the task at hand once. Her youngsters, eager for a ham and egg breakfast (well, they probably thought they’d skip the eggs) started helping mother by licking and biting the lower end of the warthog’s stomach area – always keeping a keen eye on the sharp warthog hooves flaying in the air. We were amazed that the warthog continued to squeal, despite the vice-like grip on its throat and the teenaged tongues, claws and teeth working his stomach. Our guide told us a warthog’s throat is extremely well padded and thick with sinews and suffocating does take time. 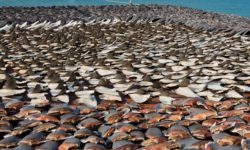 The other guests in the vehicle looked queasy and in danger of losing their own breakfasts. 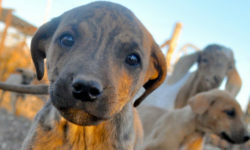 This was their first time to Africa and they were in a fascinated state of shock. The woman kept her iPhone video running on the lion kill scene but her eyes averted the other way. Another vehicle approached the scene so the lioness moved into the shade of a tree. 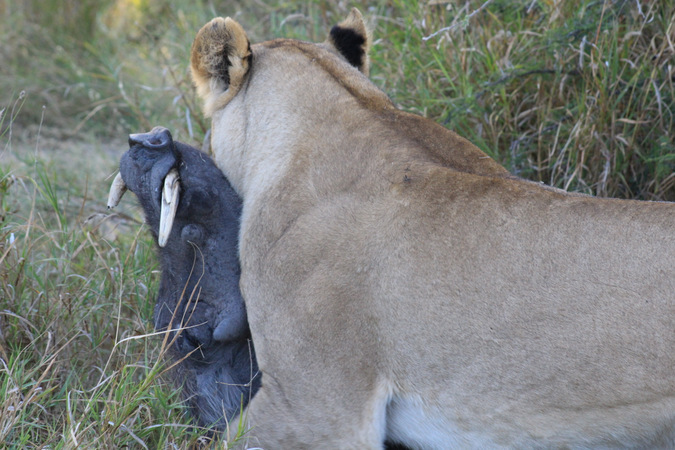 We thought we had seen enough of the lion kill, but then we heard that warthog squeal again as it attempted to wriggle free. That seemed impossible! 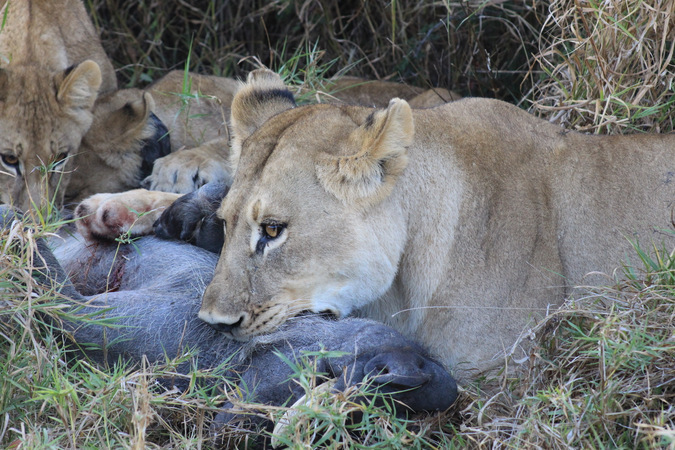 By this time the lioness had kept her steel jaws clamped on the warthog’s throat for at least fifteen minutes. Breakfast on the run is not a hurried affair in Africa. 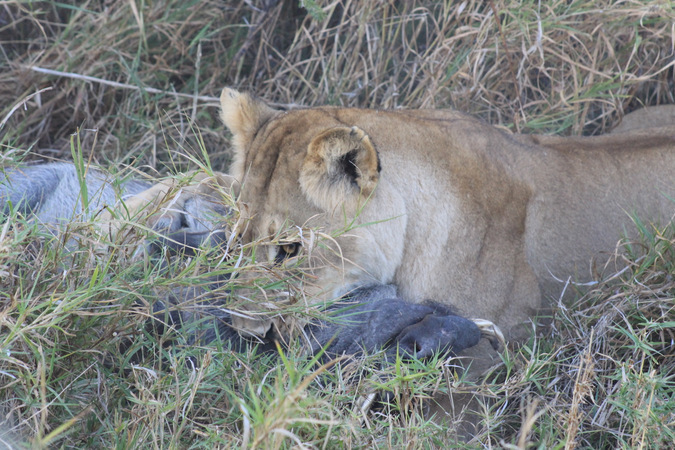 Here is a video of the lions trying to feast on the squealing warthog. WARNING – this lion kill video is not for the faint-hearted. 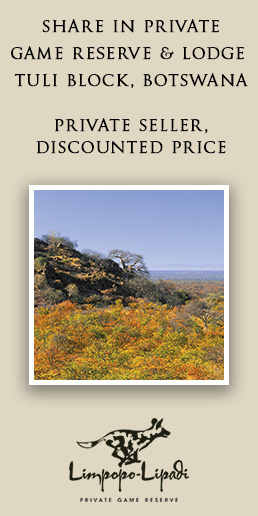 Contact Liquid Giraffe to help you book your unforgettable safari experience.